Bungie has released a new video doc that details Destiny 2's Annual Pass content for the coming year. 'Season of the Forge' kicks off the exclusive content releases today and will run through to February, offering exotic quests, a new raid, as well as a number of Black Armory forges for players to unlock. 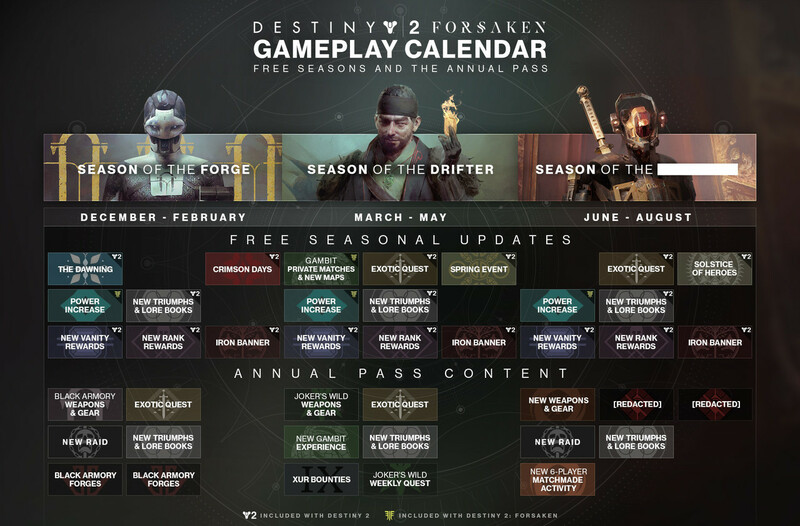 The 'Season of the Drifter' will take place from March through May, and will offer a new Gambit experience. The season will also give players access to new weapons and gear, as well as another exotic quest line. Finally, from June through to August a final season will occur – although Bungie are staying tight-lipped about its name and content. The developer has confirmed a new Raid will be introduced, while also hinting at a new 6-player matchmade activity. 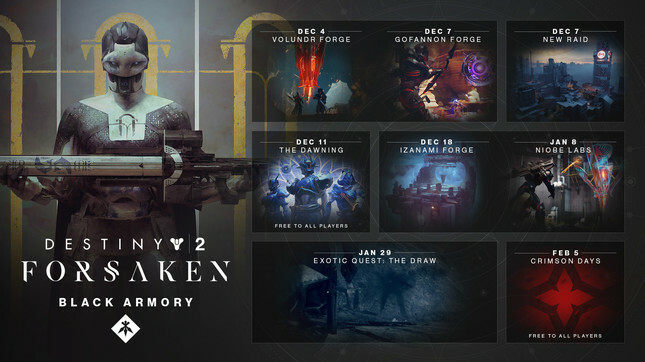 In addition to Annual Pass exclusives, free content will be available to all Destiny 2 players which will include seasonal events, new triumph and lore entries, as well as new vanity rewards. Those that have purchased Forsaken will also gain power increases with each season. It's nice to see Bungie keeping the lines of communication open. In the past the developer has been notorious for leaving its community in the dark regarding content, updates, and even bug-fixes. Forsaken was certainly a step in the right direction – our review celebrated many of the features that got Destiny 2 "back on track" – but Bungie seems to make a habit of taking one step forward and two steps backwards. Having such a clear roadmap of what to expect almost makes me want to pick up my copy again.